The project was created in the course Brand + Identity while studying abroad at the University of Victoria Wellington in New Zealand. 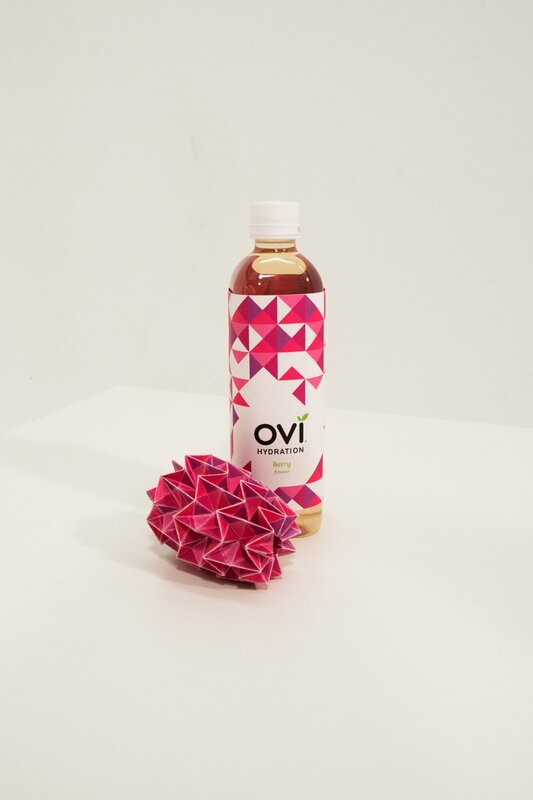 The beverage corporation Frucor, one of the largest in New Zealand, asked our class to rebrand and reinvent their new drink OVI Hydration, a healthy alternative to soda and other sugary drinks. My project proposes a sustainable bottle and label system that provides the customer with a relaxing, creative and meditative experience through origami. Thus, promoting healthy choices for the body and mind. The geometric patterns on the front of the labels reflect the full geometric grid on the opposite side, which the user can follow in order to fold the paper to create a piece of origami. The QR code on the side of the label directs the user to instructions online for in depth guidance. With a smartphone, the customer can scan the code and be taken to an online site. Currently, the QR codes take the user to existing videos of origami tutorials where the project’s inspiration began. In further development, Frucor could produce aesthetically similar and streamlined videos to replace these while still giving credit to the original creators of the patterns. The aim is to highlight a clear path for the user to participate in the interaction so that the chance of frustration or confusion is reduced in the creation process and so that the overall experience is positive. Origami provides a meditative break for the busy customer. The consumer that frequents a convenience store is relying on it to meet their impulse or other need in an efficient manner because they are short on time and very likely have a schedule they need to work around. This project aims to satisfy customers impulses by promising them a unique experience. It also aims to give stressed and busy customers a moment to stop and reflect later in their day when they get to enjoy the beverage that they buy. Origami has proven calming and relaxing effects on those that practice it. In a study carried out in a hospital transplantation unit, patients who folded multiple paper cranes over many days were able to make peace with the reality of their condition (Lockhart 2011). Folding paper and creating with ones hands helps switch gears by using a different part of the brain. While this case study may seem extreme, it is a widely accepted theory in human factors that when you design for people on the ends of the spectrum, you end up with a design that accommodates the whole spectrum. Thus, hospital patients experience more intense stress and negative emotions than the average customer; however, this means that anyone that who creates origami will also feel relief of their stress level and have a meditative experience. Through extensive prototyping of different patterns, this phenomenon is proven again in personal experience. Every time a new test label or experimental pattern is made, the experience induces a meditative and focused state. It is difficult to think about anything else or pull oneself away from the process. This project is much simpler to execute compared to other avenues that solve Frucor’s problem with equal success. However, the simplicity in this project —replacing a plastic label with an easily removable recycled paper label— has the potential to create a huge impact. One piece of paper has a lot of potential, but certain information is required in order for paper to realize its full potential. This system intends to deliver that information and demonstrate the value that it adds to paper. Hopefully, directly associating labels with origami will change our relationship with trash, recycling, and the potential of other common objects in our daily lives. The project hopes to inspire the notion that anything can be interesting and beautiful if it is given time and attention. Every pattern would be available in every flavor to provide the maximum number of combinations possible. This way, customers that like a specific flavor are not stuck with one pattern, and customers who like to make one pattern can try multiple flavors and collect each variation of the pattern. The ideal customer will engage with each pattern and try all the different flavors in order to engage with the full spectrum of the design. This opens the door to multiple avenues for establishing brand loyalty. Customers will come back to the same drink for different experiences. Thus, once a customer finishes one pattern, they can choose another pattern of similar difficulty or challenge themselves to try a more difficult pattern. While origami can be difficult for beginners, it is proven through the Flow Theory by Mihaly Csikszentmihalyi that when you put a lot of effort in, you get huge emotional rewards. Thus, affording the user this interaction gives them the opportunity to achieve satisfaction and possibly feel intrinsically motivated to return to the brand and the interaction that it affords. This system of giving labels a second purpose aims to make creative activities more common in everyday life. Using a different part of your brain and working with your hands is an effective way to manage stress and avoid the feeling of being burnt out from over working. The dairy environment is designed for only quick and easy exchanges between the store and customer. Dairies serve a convenient purpose in New Zealand. They accommodate to busy people who cannot spend time going out of their way to a grocery or specialty store. Potential consumers are university students, young professionals, parents, etc. All these types of consumers are likely to lead busy and stressed lives. Due to lack of time, consumers do not tend to loiter in dairies. The lack of loitering is also attributed to the uncomfortable tension between the customer and dairy owner when a customer is in the store for an extended period of time. The clutter of dairies is another reason why it is difficult to stay in the dairy environment. The overwhelming organization of the shelves and fridges and displays is intended to increase impulsiveness. Thus, that is why the main interaction with the drink occurs away from the dairy on the customers own time when they need a break in their day to relax. By focusing the interaction on the removal of the label, every part of this system becomes more valuable in the recycling process. Many paper samples were tested, and those in the 110 gsm to 135 gsm range work well. BJBall stocks a range of sustainable and recycled paper that is white in color and suits this application. After exploring a range of possible materials, I looked to bridge the gap between sustainable design and the Better For You value proposition. I found the connection in origami, the art of paper folding, which has a long tradition of meaningful and conscious creating. What if origami and focused creation be a part of our everyday lives? Trash has the opportunity to be transformed into something beautiful if the consumer recognizes their agency. The final patterns chosen range in difficulty in order to reach as many possible customers as possible. Easier patterns for the skeptics or those with little confidence. More difficult tessellations for those who already have had exposure to origami or those that have started with the easier patterns and want a challenge. Csikszentmihalyi, M. (1990). Flow: The psychology of optimal experience. New York: Harper & Row. Foschi, R. (Producer). (2015, May 22). Origami Simple Koi (Riccardo Foschi) [Video file]. In Youtube. Lockhart, C., & Anania, A. (2011). Origami Creations Bring Peace and Hope to Patients in Transplantation Unit. Clinical Journal of Oncology Nursing, 15(1). Nakashima, J. (Producer). (2012, May 31). Origami Magic Ball (Dragon’s Egg by Yuri Shumakov) [Video file]. In Youtube. Nakashima, J. (Producer). (2012, September 20). Origami Spring Into Action (Jeff-Beynon) [Video file]. In Youtube. Sinayskaya, M. (2012, March 14). Origami Butterfly by Akira Yoshizawa.